Here is a general guide on how to use your browser’s Developer Tools to ease the scraping process. Today almost all browsers come with built in Developer Tools and although we will use Firefox in this guide, the concepts are applicable to any other browser. In this guide we’ll introduce the basic tools to use from a browser’s Developer Tools by scraping quotes.toscrape.com. Never use full XPath paths, use relative and clever ones based on attributes (such as id, class, width, etc) or any identifying features like contains(@href, 'image'). 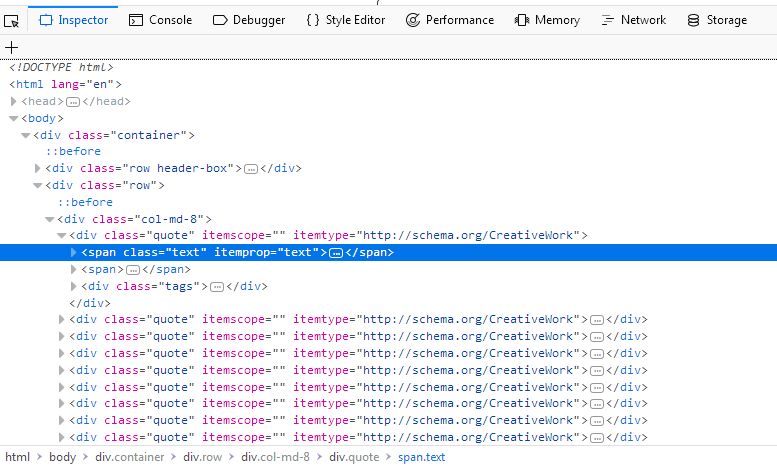 By far the most handy feature of the Developer Tools is the Inspector feature, which allows you to inspect the underlying HTML code of any webpage. To demonstrate the Inspector, let’s look at the quotes.toscrape.com-site. On the site we have a total of ten quotes from various authors with specific tags, as well as the Top Ten Tags. Let’s say we want to extract all the quotes on this page, without any meta-information about authors, tags, etc. If you hover over the first div directly above the span tag highlighted in the screenshot, you’ll see that the corresponding section of the webpage gets highlighted as well. So now we have a section, but we can’t find our quote text anywhere. And with one simple, cleverer XPath we are able to extract all quotes from the page. We could have constructed a loop over our first XPath to increase the number of the last div, but this would have been unnecessarily complex and by simply constructing an XPath with has-class("text") we were able to extract all quotes in one line. Say you want to find the Next button on the page. Type Next into the search bar on the top right of the Inspector . You should get two results. The first is a li tag with the class="text", the second the text of an a tag. Right click on the a tag and select Scroll into View. If you hover over the tag, you’ll see the button highlighted. From here we could easily create a Link Extractor to follow the pagination. On a simple site such as this, there may not be the need to find an element visually but the Scroll into View function can be quite useful on complex sites. Note that the search bar can also be used to search for and test CSS selectors. For example, you could search for span.text to find all quote texts. Instead of a full text search, this searches for exactly the span tag with the class="text" in the page. While scraping you may come across dynamic webpages where some parts of the page are loaded dynamically through multiple requests. While this can be quite tricky, the Network -tool in the Developer Tools greatly facilitates this task. To demonstrate the Network-tool, let’s take a look at the page quotes.toscrape.com/scroll. The view(response) command let’s us view the response our shell or later our spider receives from the server. Here we see that some basic template is loaded which includes the title, the login-button and the footer, but the quotes are missing. This tells us that the quotes are being loaded from a different request than quotes.toscrape/scroll. If you click on the Network tab, you will probably only see two entries. The first thing we do is enable persistent logs by clicking on Persist Logs. If this option is disabled, the log is automatically cleared each time you navigate to a different page. Enabling this option is a good default, since it gives us control on when to clear the logs. If we reload the page now, you’ll see the log get populated with six new requests. First click on the request with the name scroll. On the right you can now inspect the request. In Headers you’ll find details about the request headers, such as the URL, the method, the IP-address, and so on. We’ll ignore the other tabs and click directly on Reponse. What you should see in the Preview pane is the rendered HTML-code, that is exactly what we saw when we called view(response) in the shell. Accordingly the type of the request in the log is html. The other requests have types like css or js, but what interests us is the one request called quotes?page=1 with the type json. If we click on this request, we see that the request URL is http://quotes.toscrape.com/api/quotes?page=1 and the response is a JSON-object that contains our quotes. We can also right-click on the request and open Open in new tab to get a better overview. This spider starts at the first page of the quotes-API. With each response, we parse the response.text and assign it to data. This lets us operate on the JSON-object like on a Python dictionary. We iterate through the quotes and print out the quote["text"]. If the handy has_next element is true (try loading quotes.toscrape.com/api/quotes?page=10 in your browser or a page-number greater than 10), we increment the page attribute and yield a new request, inserting the incremented page-number into our url. You can see that with a few inspections in the Network -tool we were able to easily replicate the dynamic requests of the scrolling functionality of the page. Crawling dynamic pages can be quite daunting and pages can be very complex, but it (mostly) boils down to identifying the correct request and replicating it in your spider.